Every week, through his videos, podcast, newsletter and blog, Jim serves up new and exciting Smart Marketing and Business Building Strategies™ for growth-oriented entrepreneurs and small business owners. Can You Handle The Truth About Small Business Success? For more than five years, Jim has been distributing free weekly video training to help tens of thousands of entrepreneurs and small business owners grow more profitable businesses faster! 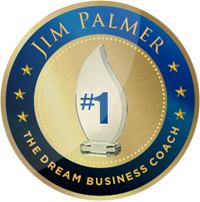 Jim Palmer, best known internationally as the Dream Business Coach, is the founder of the Dream Business Academy, creator of Dream Business Coach TV, and host of Dream Business Radio - a weekly podcast based on Jim’s unique brand of smart marketing and business building strategies. Jim Palmer’s live event is different from every other event you’ve been to. In a pitch free environment, you get up close and personal with Jim and his team as they not only teach you how to create a Dream Business – you will leave inspired and empowered –armed with a blue print to do just that! Dream Business Academy will prove to be the most important event you will attend – book your seat for the next event!